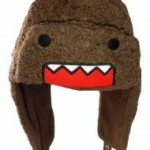 Domo with knit headphones- or earmuffs if you prefer! 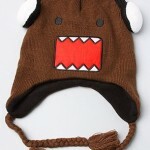 The Domo Felt Headphone Knit Hat. Knit hat featuring embroidered face graphic; ear flaps; fleece lining 100% acrylic shell; 100% polyester lining Buy today, before they’re gone! 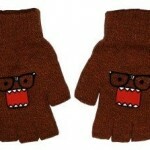 Domo Nerd Fingerless Gloves are a great way to keep warm, and still use your smartphone. 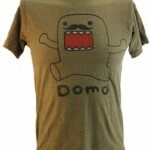 Domo with a Mustache T shirt by “In my Parents Basement”. Sports a well hidden domo on the shirt, see if you can find him! Free Super Saver Shipping + Free Returns on Qualified Orders.